President Cyril Ramaphosa got a taste of what South African commuters regularly experience on Monday. 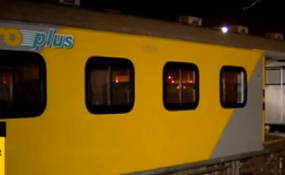 South Africans watched video clips showing him stuck on a Pretoria Metrorail train for several hours. "We are going to take steps to fix the situation," promised the president in a video shot by ENCA. The breakdown of commuter train services across the country is a direct consequence of the massive looting of the Passenger Rail Agency of South Africa (PRASA) by past CEOs and boards, especially Lucky Montana. It epitomised state capture. The media has reported this grand-scale theft extensively, as well as the daily difficulties that commuters experience (see, for example, our coverage of the #PRASALeaks). Activist groups like #UniteBehind, the Rail Commuters Action Group and Public Transport Voice have for years been drawing attention to the collapse of Metrorail. Declare a disaster and appoint a disaster management team to assist the PRASA board and management. Appoint a top-quality permanent board which appoints permanent staff, based on merit and experience. Urge the board to extend rail tickets for commuters by a month to acknowledge that they have been unfairly treated and to encourage them to return to using the trains. There will also need to be further prosecutions of the people who destroyed PRASA.